Organizations of all kinds are using video in their marketing and communications, and that means writing for video is becoming an essential skill for communicators. But most have either never written a video script and don’t know where to start, or they’ve tried it and discovered how much there is to learn about the craft. 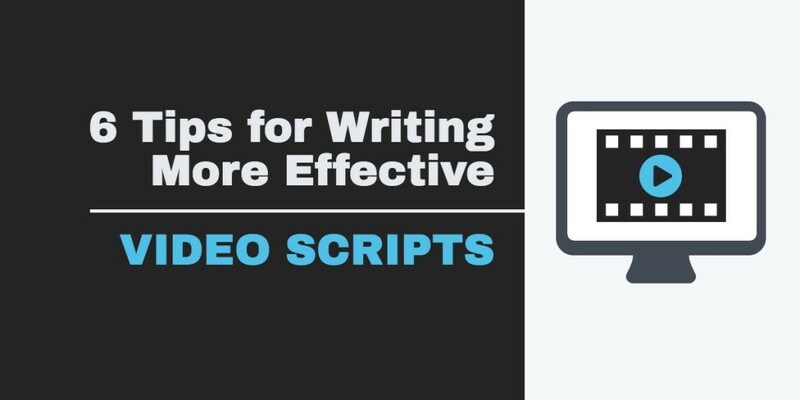 A video script is different from most other communications documents – it’s a blueprint for a video, and that means it has unique challenges. As a professional scriptwriter and producer, I have six tips to consider when tackling this surprisingly nuanced writing challenge. It’s helpful to remember that a video communicates information in two streams: audio and visual. Of course, the viewer experiences both streams simultaneously, so it’s important for these streams to work together. If you’ve ever created a PowerPoint presentation, then you are familiar with this principle. But video takes it to a whole new level. Scriptwriters use a format called the “Audio/Visual Script”. The idea is simple: you separate the audio and visual narratives into two columns. On the left side, you describe what the viewer is seeing, and on the right side you write the dialogue. It also makes sense to separate the columns into discrete rows. This helps to pace out the script, and ensure that the images align with the dialogue. This format isn’t necessary, but it is certainly advisable. Even if you’re the only person who ever sees the script, it’s useful to outline the content for pace and flow – elements that are more important in scriptwriting than in most other form of writing. You might be wondering how scripting relates to editing. For example, will the editor look to the script when determining when and where to cut the footage? There is no general rule for how this is done, but it’s helpful to think of editing as a tool in your scriptwriter’s tool belt. Here’s a short video that demonstrates how different kinds of editing can actually be consciously scripted in a simple video. Language ranges in abstraction. Some words describe ideas that are highly abstract like “efficiency”, “gratitude”, or “growth”. Other words describe ideas that are much more concrete – things like “truck”, “dog” or “windmill”. You can always tell which ideas are more concrete because you can easily picture them. If you were playing Pictionary, you’d have an easier time drawing a “dog” than you would drawing “gratitude”. This is important, because language in the “visual” column of a script cannot be abstract; it must describe images in literal detail. If your “audio” column reads “This year we improved efficiency by 15%”, your visual column should not read something like “image of efficiency”. It must read “bar graph of last year’s increase in efficiency” – or maybe “green arrow grows and trends upward along a horizontal axis”. In both of these examples, you can close your eyes and see the image clearly. Writing with concrete language will reduce ambiguity among the various people involved in the project. Don’t leave your script up to interpretation. This year was one of our best (it was very profitable) because we improved our processes. Using parentheses in this way is tolerable in writing, but can be problematic if written as dialogue. The problem is that nobody hears parentheses. If you read this sentence aloud, that small parenthetical remark confuses the grammar of the sentence, and thus confuses the listener. That is why you must be very precise with punctuation when writing dialogue. Try to avoid complex clause structures, and use periods more than you use commas. Often, you won’t see the problem in the punctuation until you’ve actually uttered the words. And while you’re at it, look for natural emphases in your dialogue. If a word is important, SHOW IT to your reader in capital letters. This not only helps your speaker’s voice to be more dynamic; it can also affect the meaning of the words in subtle ways. Consider the difference between: “We’re eating dinner at HOME at seven o’clock,” and “We’re eating dinner at home at SEVEN o’clock”. In each case, the speaker’s dialogue has two distinct meanings whose effect derives from the intonation of one word. If you read your dialogue out loud, you will likely discover that you naturally emphasize certain words and phrases. If you do, re-write them in caps-lock; otherwise, your speaker might intone incorrectly, and change the meaning of your script. One important point about videos is that they all strive for engagement. Simply put, if you have a boring video, nobody will watch it, and then it won’t matter how ‘on message’ it is. That message simply won’t be heard. So how can you win the battle against boredom? As you can imagine, there are many different creative ways to make a video interesting, but the tried-tested-and-true principle that underlies all good scriptwriting is storytelling. This doesn’t necessarily mean you need characters, a plot, and a moral; it only means you need to write with narrative logic. Before you even sit down to write a script, you should imagine what the video will look like. But you should also imagine how, where, and why your viewer is watching. Are they scrolling through Facebook? Are they sitting in a conference? Are they considering buying the product? Have they even heard of the product? Even basic questions like How long is the video? and What is the call to action? are important strategic questions. As a scriptwriter, you are not necessarily responsible for developing that strategy, but you certainly need to know it in order to write an effective script. Your job, after all, is not only to engage, but also to produce results. If you’re not perfectly clear on what that result is, get clarification from your collaborators before you write a single line of dialogue. Andrew Muir is the script writer for Basetwo Media, a video production agency in Vancouver that helps organizations get results with video in their marketing and communications, and one of IABC/BC’s sponsors. Learn more in Basetwo Media’s upcoming ‘Scripting 101’ webinar where Andrew will go into more detail on these tips and more.